WILLEMSTAD - Yesterday evening around 11 pm the Frisc interceptor vessel of the station ship Zr. Ms Zeeland was dispatched with a team of the coastguard on board after a suspicious boat was spotted east of Curaçao. Upon arrival, it turned out to be a Yola boat with 37 undocumented on board, including a minor. The Frisc received assistance from a Coast Guard Metal Shark to transfer all passengers to the station on Parera. 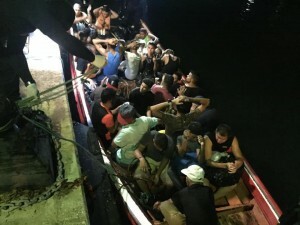 After all coastguard formalities were completed, the undocumented migrants were handed over to the assistant public prosecutor early this morning.